The town prepares for a festival of bamboo lanterns, but will the weather cooperate? 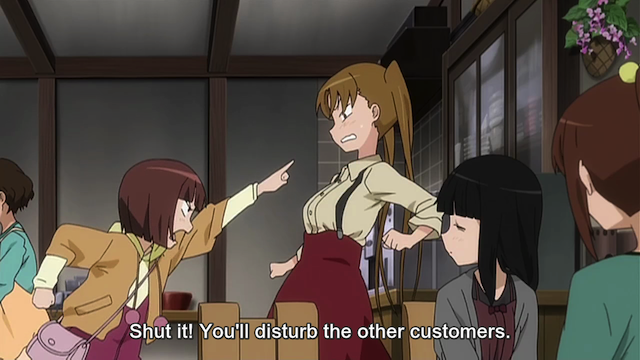 Episode 7 was one of my favorite episodes of Tamayura ~ hitotose yet. It had some of the classic elements that make Junichi Sato’s Healing series so effective. There was a light tone, minimal plot (mostly, will it rain? ), a strong sense of place, and a quiet appreciation for how people can work together to make this a better place. The town is getting ready for a festival in which lanterns made from cut bamboo are placed all around, creating the “Road of Aspiration”. 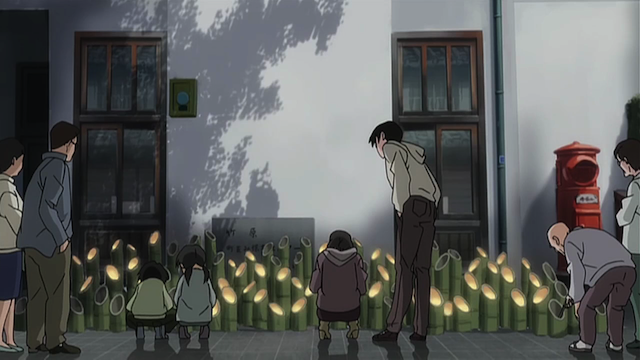 Since Fu hasn’t been to one of these festivals since her dad died, the girls make teruterubouzu (dolls that are considered charms for good weather). 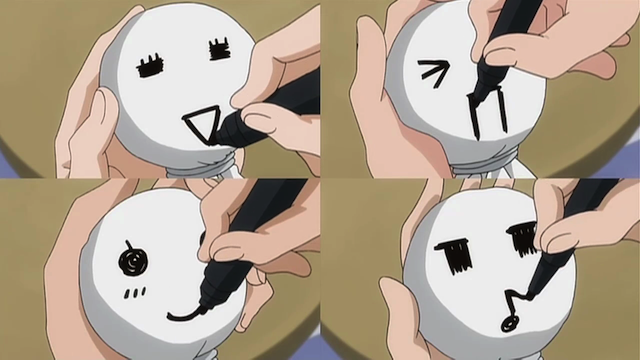 I have mentioned before (here and especially here) that an important part of Sato’s style of “healing” anime is the depiction of people making things by hand, crafts, cooking, and the like. There seems to be a message along the lines of the ennobling power of work. This episode saw that theme treated again and again. Maon Sakurada: Sense of Hearing. Kaoru Hanawa: Sense of Smell. Fu Sawatari: Sense of Sight. This episode also confirmed something that I have been thinking about. Each of the girls is representative of a different sense. 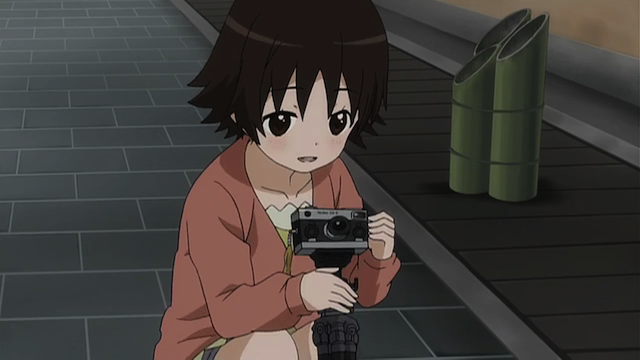 Fu, whose hobby is photography, is illustrative of the sense of sight. Maon-chan, who whistles, and wants to “do something with music”, is the embodiment of the sense of hearing. Kaoru, who makes perfumes and potpourri as a hobby, represents the sense of smell. Norie, who is studying to be a pâttisier, represents the sense of taste. 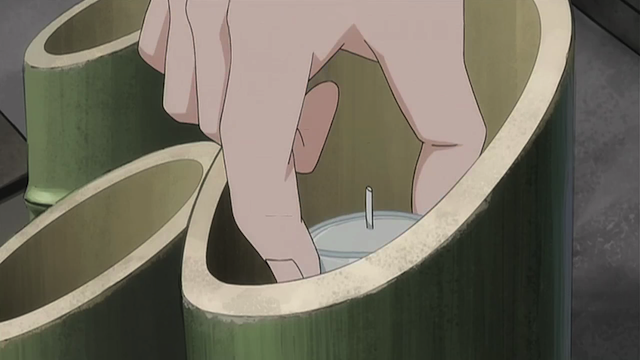 This leaves only the sense of touch, which might be allocated to Fu’s friend, Chihiro, who makes puppets and fabric dolls. Drama 1: Despite making weather charms, rain seems like it will cause the festival to be cancelled. 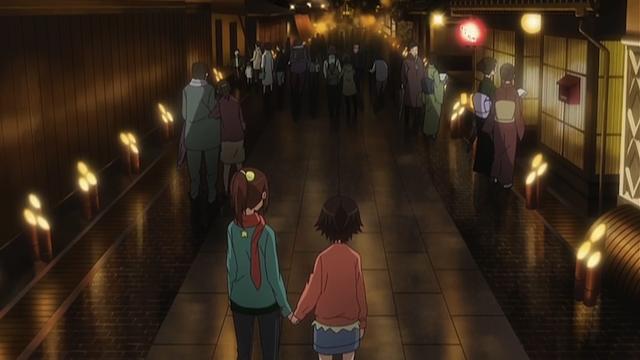 While waiting to see if the festival will be cancelled, the girls wander about town, and come across at least three people who are preparing to confess their love during the festival. One of them is the rambunctious grade schooler that is a rival to Norie Okazaki for Kou’s love. They also meet some old friends, and overhear the conversations of strangers discussing how they are looking forward to bringing a friend the next time, or how they have finally fulfilled a promise, and they see the villagers preparing for the festival, including an orchestra that is rehearsing the OP song performed on bamboo instruments. All of these little stories are woven together to raise the stakes for canceling the festival. So many people put so much effort into preparing for it, and so many people have placed their hopes into it for bringing them happiness, but a little rain can destroy all of it. Fortunately the rain lets up in time, and the lanterns are lit. Let the festival begin! These lanterns are made with paper upon which festival-goers have written their wishes. People enjoying the Road of Aspiration festival. 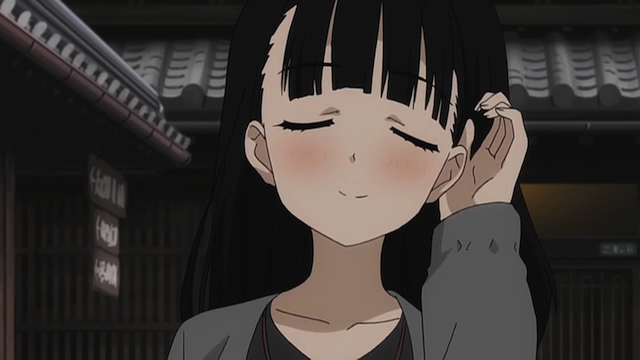 The episode ended with an extended view of scenes from the festival, over which a new ED song, Hoshizora, was performed by Megumi Nakajima, who performed the other two EDs. Not only did this provide conclusion to the main plot of will the rain force the festival to be cancelled, but it also was used to reveal the wrap up of various sub-plots that had been introduced, such as one girl who was clearly grieving for a loved one, and the various confessions (most of which turned out comically). 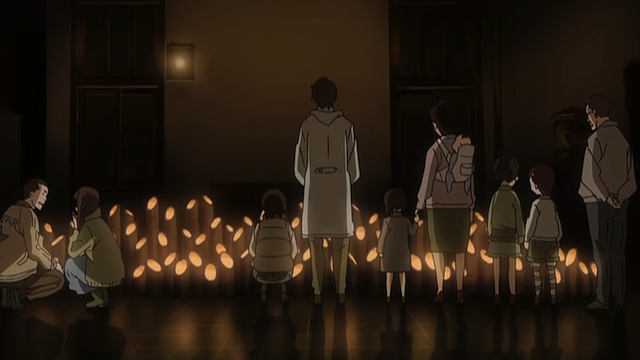 I think this episode really shows the difference between the so-called “Healing” genre, in which plot is minimized, but put to effective use in setting up an emotional catharsis, and other so-called “Slice of Life” shows, in which nothing really happens. Junichi Sato knows how to find the drama in everyday life. 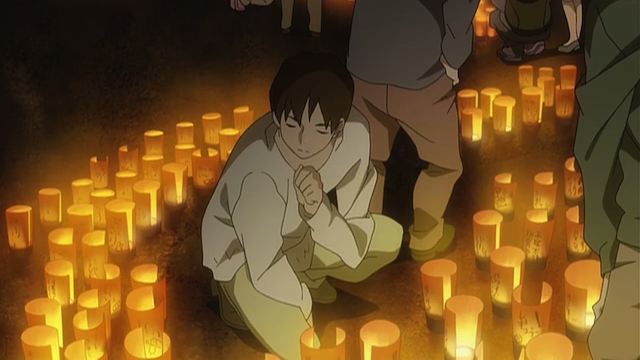 This episode wasn’t just look at the pretty lanterns (or even cute girls being adorable). 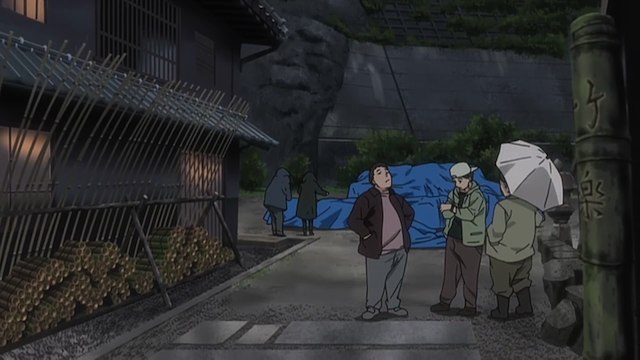 This episode was about how something simple like a passing rain storm can threaten to crush the dreams (aspirations) of a whole town full of people. I loved this episode and definitely thought it was one of the sharpest of series. Checking on ANN, I noticed that this episode was the first one that Mamiko Ikeda wrote the script for. She was the one who wrote the screenplay for all of Croisée in a Foreign Labyrinth – The Animation except episode 4.5 (which Junichi Sato did). Wow. That’s an interesting point. Croisée episodes also rose above mere “fuwa fuwa”, and provided some thoughtful but very human-scaled drama, on top of the undeniably cute characters. Thanks. I hope you are enjoying the show.